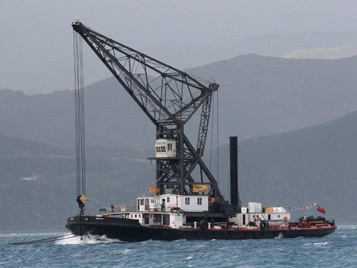 21 December 2011 marks the 85th anniversary of the arrival of the historic floating crane Hikitia in Wellington. Following trials, Hikitia left Glasgow on 29 September 1926 under Captain J Fullerton for Ponta Delgado in the Azores, a distance of 1445 miles, where she arrived on 9 October. After bunkering, she left for Colon and the Panama Canal, passing through the canal on 2 November. 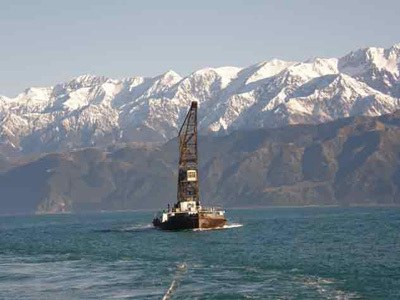 Out in the Pacific, Hikitia encountered strong head winds and rough seas, which caused the vessel to pitch heavily. The next 48 hours were anxious and stressful for the crew with the superstructure straining and some deck plates beginning to crack but then conditions improved and repairs were made. The ship reached Papeete harbour on 1 December and took on stores and coal, sailing next morning for New Zealand. The final part of the voyage was not without incident, as on 13 December Hikitia ran into a submerged object and several days were spent battling rough seas and strong winds. At 7.5 knots (approx 15kph) the ship was hardly a flier! The log of the Hikitia's delivery voyage is preserved in the archives of the Museum of Wellington, City & Sea on Queen's Wharf. Hikitia began work almost immediately and for 83 years has been a familiar sight on the harbour, mainly taken for granted and unheralded. She has worked on all types of construction projects including wharf construction, though her main role was in lifting heavy cargo on ships. She spent some time helping to demolish the wreck of the Wahine. In 1989 the old vessel was put up for tender. Ship lovers imagined Hikitia would be for the knacker's yard and that she would be lost forever - but this did not happen. On 12 April 1990 the maritime enthusiast couples of Bob and Mary Box, and John and Joy Ackrill bought her for preservation. On 30 July 1992, after much hard work by volunteers, Hikitia carried out a successful 88 ton test lift. This was the final legal requirement for survey and, as Hikitia Heavy Lift, she became available for commercial lifts up to 80 tons. Hikitia's lifting capability is one of the key reasons the Global Challenge fleet has been three times to Wellington. On 16 March 2006 ownership was transferred to the Maritime Heritage Trust of Wellington. Trustees include Nigel Gould [chairman], Bill Day, Alfie des Tombe, Peter McKnight and Malcolm McGregor. The goal of the Trust is to refurbish and maintain the ship as a working vessel to demonstrate the purpose for which it was built and to help earn its keep at the same time. The Ackrills remain involved and they, and usually 12 to 20 other dedicated helpers, are on board most Saturdays carrying out maintenance and making the ship truly self sufficient. After an assessment of the ship in 2008 it was found that repairs were needed. Funding of $660,000 was obtained and that along with the waiver of some fees and considerable work done voluntarily allowed a major upgrade plan to be undertaken. 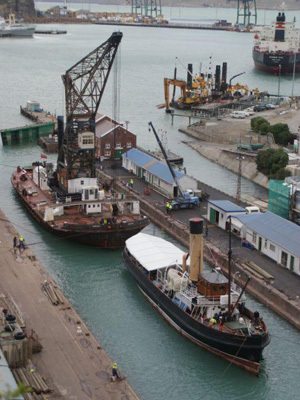 The ship was towed to Lyttelton in June 2009 and a successful drydocking of 35days was made allowing completion of a full hull and mechanical repair program. This was the first time in 28 years the ship had been out of the water. Extra money was found to waterblast and paint the crane structure and deck, to repair the deck belting and to make up an initial shortfall of funding. The total maintenance cost eventually exceeded $780,000. Funders for the refurbishment and operating expenses included Lotteries Grants Board, Community Trust of Wellington, Lion Foundation, Wellington City Council, Pelorus Trust, Pub Charity, Wellington Waterfront Ltd, CentrePort Limited and significant private donations. Since return of Hikitia to Wellington on 5 November 2009 the reinstatement of the steam bilge pump and fire fighting system has been completed, the refurbishment of the Gear Room at the base of the crane has almost been completed and the repair of rudder boxes and stocks steering mechanisms is well advanced. 2011 planning is for the ship to be made fully self-sufficient, a status which will ensure her long term survival. 2008: Hikitia won the Heritage & Environment category of the Wellington Airport Community Awards. 2010: Hikitia was Runner Up in the heritage section of the inaugural Encore Awards. 2010: IPENZ recognised the importance of Hikitia’s part in New Zealand’s engineering heritage by unveiling a bronze plaque on her. Hikitia is a special part of Wellington's maritime heritage and has earned respect for her years of service to the port and the uniqueness of her construction and machinery. She continues to provide a specialist waterborne lifting facility. Additionally, she has become an 'ark of knowledge' for ship working skills that otherwise would be lost or forgotten. Hikitia's presence at her berth near the center of town uplifts the ambience and interest level of the Wellington waterfront making her a popular weekend visitor site. Hikitia remains available for hire to carry out lifts or as an events venue. Weekend work party volunteers are always made welcome!